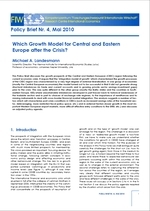 This Policy Brief discusses the growth prospects of the Central and Eastern European (CEEC) region following the current economic crisis. It argues that the 'integration model of growth' which characterised the growth processes of the CEEC region was characterised by a very high degree of external liberalisation. In one group of economies (mostly the Central European economies) the model turned out to be successful in that it did not generate strong structural imbalances (in trade and current accounts and in growing private sector savings-investment gaps) prior to the crisis. This was quite different in the other group (mostly the Baltic states and the countries in South-eastern Europe, SEE) where unsustainable imbalances developed in part traced back to historical weaknesses of the tradable sectors and in part to choices of exchange rate regimes, to the importance of remittances and to missing instruments to deal with cross-border financial market integration. The analysis suggests a number of fac-tors which will characterise post-crisis conditions in CEECs (such as increased savings rates of the household sec-tor, deleveraging, more restricted fiscal policy space, etc.) and in external factors (lower growth in the most im-portant Western European export markets, more difficult effective entry conditions to the EMU, etc.) and discusses an adjusted policy agenda.